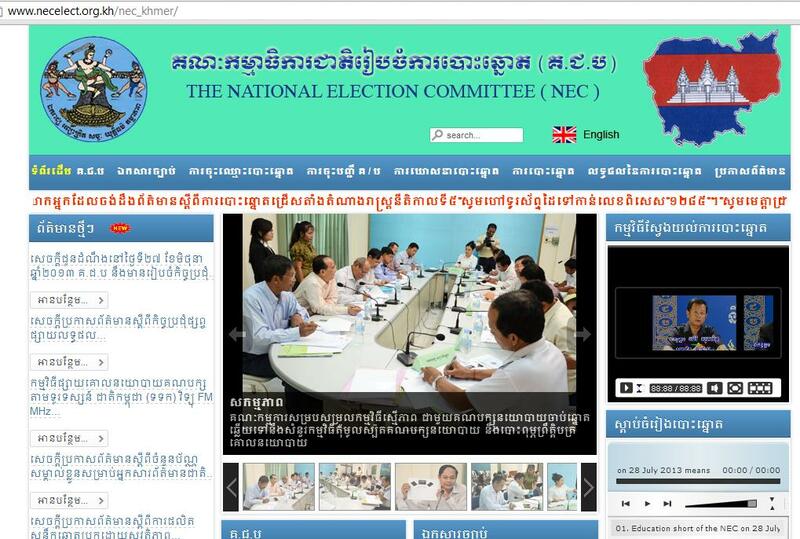 Reading the report of Cambodian Daily today on the irregularities of voter listing by NEC is another serious issue constraining the building of democracy in Cambodia. The random sampling of 4,900 registered eligible names of the research found that 10.8 percent or more than 500 registered voters could not find their names on the voter list. This percentage is terribly higher than national election of 2008 which was 7.7 percent. With this figure, I am speechless! It is absolutely the responsibility of the National Election Committee. If we find out that this number is true, it means NEC is incompetent and we must dissolve the current body in order to pave way for a capable body to run the election in Cambodia. However, the report on March was also illustrating the incapability of the NEC on this same issue, and this same issue has been lingering for many elections in Cambodia. Now, it is time to condemn NEC that this is a criminal act of stealing the heart, honesty and integrity of the Cambodian people. Innocent Cambodians should not be tolerant by the incompetent act of Cambodian National Election Committee. Cambodian people must stand up and speak out loud! With little more than a month to the July 28 national election, the issue that is of particular concern to election monitors is the voter list, which they say is less accurate and representative of the electorate than during the last national election in 2008. The accuracy of the 9.6 million-strong voter list came under fire in March and those concerns were reiterated with the release of the final version on Friday of an independent audit report, which found a number of serious errors, namely that more than 1 in 10 peo­ple who are registered for July’s election appear not to exist, and that 9 percent of past voters have been taken off local voting lists unfairly. The report, which was originally released in March, was compiled by the Neutral and Impartial Committee for Free and Fair Elec­tions in Cambodia (Nicfec), the Cen­ter for Advanced Studies and the Wash­ington-based National Dem­o­cratic Institute. The National Election Commit­tee (NEC), however, has largely disregarded the report arguing that it contained data they said was collected in an unorthodox way. The report found that 10.8 percent of 4,900 registered Cambo­dian voters, chosen by random sampling, could not find their names on the voter list. That figure compared poorly to the 7.7 percent of registered names that could not be found on the voter list in 2008. When the auditors assessed the names that were deleted from the voter list, they found that 9.4 percent of them had been erroneously removed, which is also the same number as in 2008. And of the people sampled in the report, only 63.6 percent of the names on the list could be verified in person to live where they are registered. The report also found that just 82.9 percent of eligible citizens are registered to vote in the election, which is a decrease of some 5 percent since the last election in 2008. That 82.9 percent figure contrasts starkly with the NEC, which maintains that the number of registered voters is at 101.7 percent of the eligible population. Overall, election monitors say, such flaws will directly impact the vote. And the problems don’t end there. Since the voter list was finalized and made public in January, copies of it have been distributed to commune offices around the country, with the intention of giving registered voters a chance to verify that their names are on the list before election day. However, Nicfec coordinator Sam Kuntheamy said Friday that confusion has erupted, particularly because some new polling stations have been set up without voters’ knowledge, and people don’t know where to go to find the list or their names. “They [are] confused and don’t know where the polling station is,” he said. “But I’m not concerned about this. I think the election will just go smoothly,” he added. “It is a systematic farce; they have the mechanism to remove the names of voters,” he said, adding that he believes there will be “many problems” on election day. NEC Secretary-General Tep Nytha said he had not heard of any issues arising from people being listed to vote at different polling stations, as is the case in Kompong Speu. An updated voter list will be posted around the country on June 26, he said. “NGOs have copied that [voter list] and distributed it to the provinces,” Mr. Nytha said.